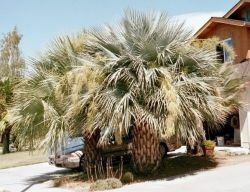 Comments: Palm native to Baja California and Northwest Mexico. A very attractive blue-green fan palm with distinctive pale yellow flowers. Tree grows to 35' and is drought and frost tolerant. Dead leaves aren't discarded naturally and must be trimmed.